It’s recipe round-up time again! We eat a lot of chicken at my house…probably 3-5 times a week if I were to guess. And with both Ben and I working full-time, we often fall into dinner ruts, and 5pm ‘what are we going to eat? !’ freak-outs. I think I need to get into meal-planning, because we are not very organized here! I don’t know what I’d do if I didn’t meal plan! I usually just plan two dinners to cook each week, and then we have two nights of leftovers, and the other three nights are easy things like a simple homemade pizza, breakfast for dinner, etc. That way I’m not overwhelmed by trying to choose a recipe for each night of the week! I love this roundup! I’m definitely getting inspired for next week’s meal planning! Thanks for including my bbq chicken salad! I always need new chicken ideas and I am so guilty for the dinnertime freak-out so this round-up is perfect! Love all these recipes, they look amazing! We all need more chicken dinner ideas in our lives, but who would have thought they could be as beautiful as these? They are all so gorgeous! To actually make, though, I love the idea of that chicken skillet parmesan … mmmm! Thanks, Helen! I have so much dinner inspiration now, I don’t know where to start! I have a bad habit lately of doing the dinnertime freak out — these will help! Thanks for including me! Oh man, I am so bad for the dinnertime freak-out! I am so disorganized 🙁 Your chicken parm looks delish! What a great compilation! Thanks for this, I’m a big chicken eater myself so I’ll definitely be trying out some of these. Love that they’re easy, too! Thanks, Sam! I have a few I need to try out, too! LOVE all of the recipes here, Denise!! Because, when it comes to chicken, you need to have flavor and all of these look so good!! 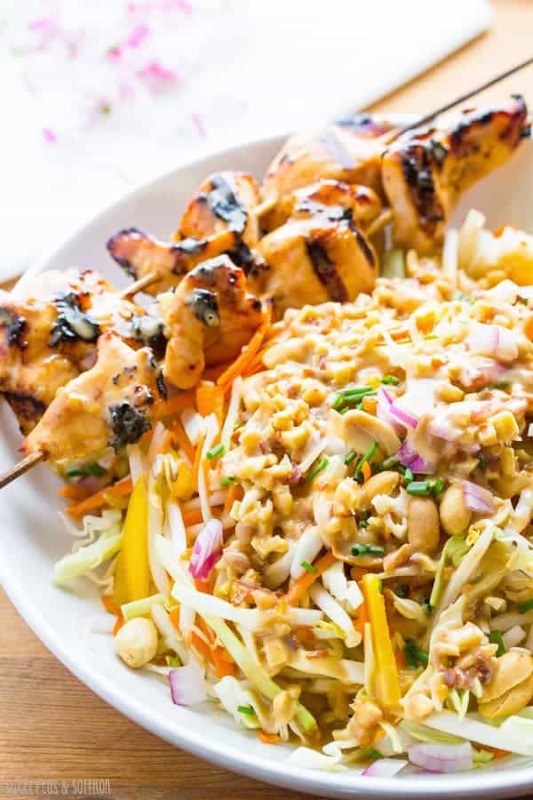 WOW, those Chicken Skewers with Satay-Style Peanut Sauce . . oh my gawd. . . I’m dying. . want those now!! I need to try those chicken skewers! I am down for anything peanut/satay sauce. Thanks, Alice! I just had chicken for dinner tonight and now I want more! These recipes look scrumptious, and you did such a phenomenal job on this round up! This roundup is AWESOME! I need more chicken ideas – thanks for including me! Pinned! Love this collection! We eat lots of chicken too so this is very helpful. I ‘m so glad I found your blog trough a fellow blogger’s site. Thanks for stopping by, Oriana! Chicken is so amazingly versatile, isn’t it? I can’t decide which to try first! We eat a lot of chicken at our house too. It’s our main protein. Great roundup! This is SUCH a good round up! I am always clueless when it comes to chicken, this gives me so much inspiration! Chicken is such a blank canvas that sometimes I’m just stumped! Thanks, Annie! We always buy a huge bag of chicken each week and eat it all during the week. This roundup is great inspiration! Thanks for including me, Denise! What a fantastic collection, Denise! My husband and I eat chicken all the time, so I’m always looking for new dishes to make. 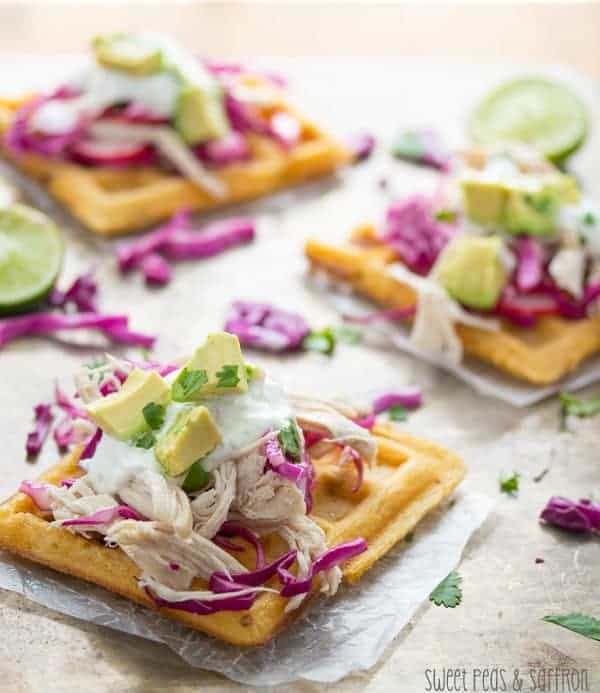 I definitely have to try your chipotle waffles! Pinning a bunch! Thanks, Gayle! I find I have my ‘go-to’ chicken recipes and they tend to get a bit boring over time. I have so much inspiration now! You have so many great chicken recipes, Sarah, and of course they are all so pretty, I had a hard time choosing! Can’t wait to try them! Me too, Liz! 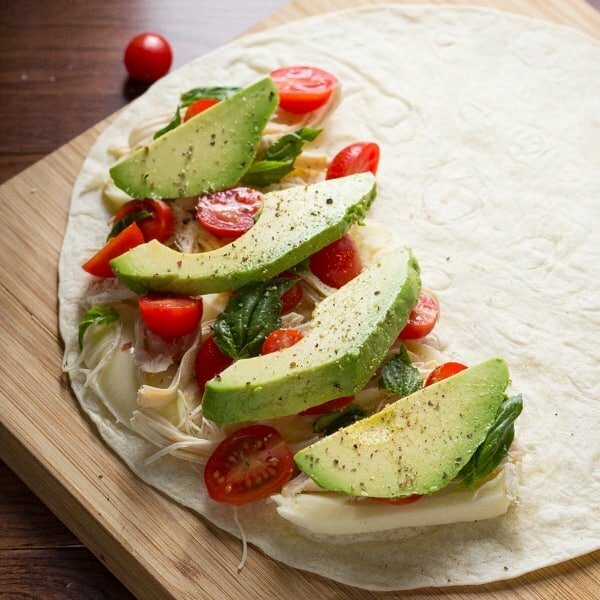 Love that you don’t need to make a crust! And your salad looks delish, too, that peanut lime dressing sounds to die for! I need to get onto that meal planning bandwagon, seriously! I am organized in many aspects of life but NOT dinner 🙂 Your Casserole looks delicious, Bri! Can’t wait to try it!